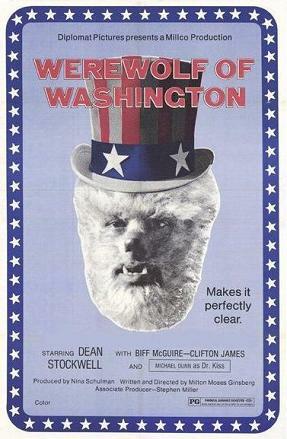 Werewolf of Washington (1973) -- Full Movie Review! Is this a comedy? 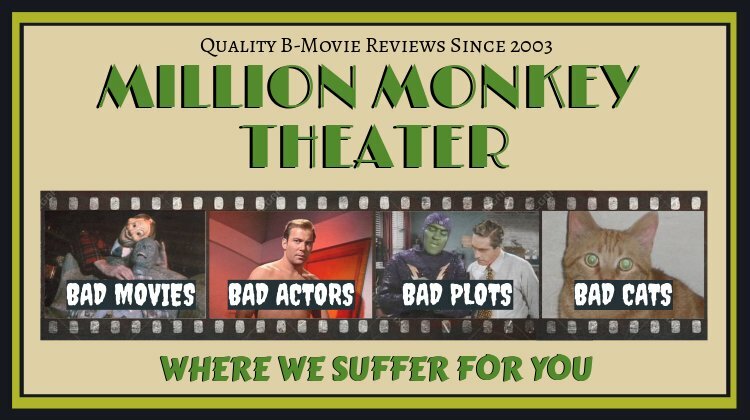 Is that what all the tags on IMDb say? Seriously? How can you have a "comedy" without one single laugh, not one single snicker? What about all those blurbs that say this is a "funny" movie, would movie critics lie to me? Oh, wait, Burn After Reading, yeah, ok, that's true. First off, all the documentation on this stinker give it a release date of 1973, but that can't be right. There are numerous internal references to Nixon's resignation, things they couldn't have known in 1973, so it has to be at least 1974, and more likely 1975 or later. How damn hard is it to get the date of a movie right? Come on! We begin behind the Iron Curtain in Hungary where we meet an American named Jack, whipsnap reporter and Washington ladder-climber, here on assignment from his newspaper. 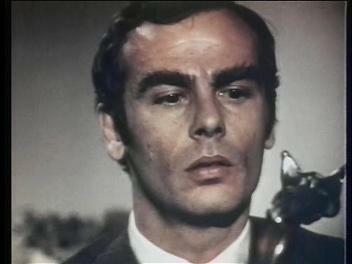 Jack is played by 37-year old Dean Stockwell, who I'm sure has had a nice career, but I can't focus on anything but those monstrously bushy eyebrows which loom above his eyes like tangled thickets of Normandy hedge. I bet there's rabbits in there. On the way to the airport late at night, he has a car accident in the dark and spooky woods. He wanders through the dry ice fog until he finds a band of Gypsies, who run off and leave him there after rattling off some mysterious warnings. Then Jack is attacked by a wolf who turns into a man! The whole time Jack has fortuitously been carrying around this silver-tipped walking stick that his hot Hungarian girlfriend gave him and he uses this to pound the wolf/man to death (because, you know, silver kills werewolves). Unfortunately for him, Jack was bitten by the beast before it croaked. Surprisingly, Jack goes immediately to the local police and turns himself in for killing a guy in the woods (he doesn't believe in werewolves). The Hungarian officials, however, straight up tell him to get on a plane and go back to America without pause. 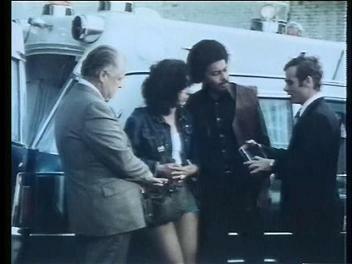 Outside the station, he meets an Old Gypsy Woman, who Jack recognizes as one of the Gypsies that he met in the woods. This and that is said, and Jack learns that the man he killed was her son, and that he was a werewolf. Instead of being mad, the Old Gypsy Woman is grateful, as now her son has "been released". She further warns Jack that if he was bitten by the werewolf, then he himself will become a werewolf on the next full moon. Jack, being a thoroughly modern man, scoffs at this and gets on the plane. Note Lenin there over his shoulder, he's coming back into fashion with the ironic hipsters. To Washington DC now, where Jack meets President Nixon, who offers him the prestigious post of White House Press Secretary. 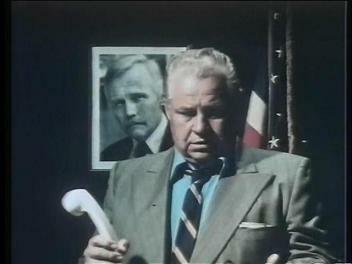 While the movie never says the President's actual name, it's absolutely Nixon, or at least a satiric parody of Nixon, complete with goofy mannerisms and sweaty brow. At a dinner party one night (a full moon night, dumdum! ), Jack is chatted to death by an outspoken old Southern Belle, who is clearly meant to be Martha Mitchell from Watergate times (this movie is full of these sorts of period-specific parodies, which understandably don't age well). To his utmost surprise, Jack sees the image of a pentagram appear briefly in the palm of the woman's hand. Are werewolves traditionally associated by Satan? Pentagram on the Mouth of the South's hand. Later, Martha is stumbling home in the dark, alone and drunk (in Washington DC, the murder capital of America?) when she's attacked by a werewolf! 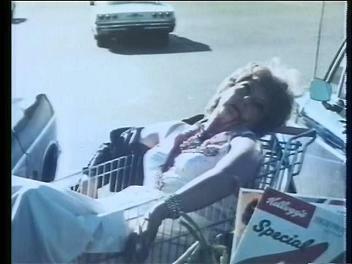 While we only see the beast in shadows, the next day the victim is found in a shopping cart, mauled badly, one of the few semi-gory moments in the film. Jack wakes up the next morning remembering nothing. Cereal killer on the loose! Get it? Huh? Huh? Jack works closely with the US Attorney General, a bumbling, incompetent, clueless, arrogant Boss Hogg sort of fellow who hates everyone and anything not just like him. You can tell he's a bum because of his perpetually unkempt Windsor knot, which is Hollywood shorthand for a braindead guv'mint official. The Attorney General does have a lot of the best lines in the movie, though, being sort of the audience's voice of discontent with the Nixon administration. As before, however, his surely witty jabs are lost in the swirling sands of time. The AG. Is he supposed to be Elliot Lee Richardson? Next, Jack sees the pentagram o'death on his overbearing starched-collar editor's hand. She's there to talk with Nixon about censoring the press, in a none-too-subtle jab at the real Nixon's oft-contentious relationship with the DC print media. Jack freaks out at the pentagram, virtually running down the hallways of the White House to get away. The editor later that night gets in her fabulous Plymouth Fury and drives down to the Mobil gas station to pump her own gas (a modern woman, indeed!). 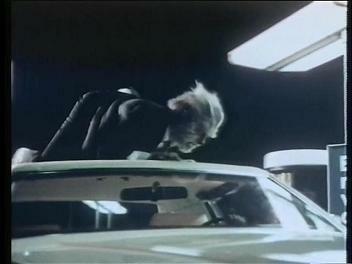 She doesn't notice until too late that she's got a werewolf riding on the roof of her car (hey, like in Teen Wolf!). She is, of course, killed by the beast. Jack later begins to suspect he's a werewolf and that he killed those two women. His shoes and shirt are always missing, there are gaps in his memory, and he surely has chunks of middle-aged woman in his teeth. 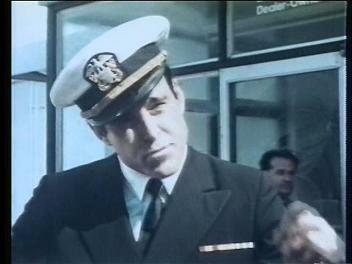 He goes to see a US Navy Psychiatric Doctor and confesses his suspicions. Amazingly, the Navy Doctor just blows him off, claiming it's all hallucinations due to "guilt and stress" (so much for the DSM!). He also waves off Jack's pentagram-shaped scar when he disrobes in the bathroom with him (dude needs to work out). In a totally unrelated note, the Navy Doctor is dating Marion (the First Daughter), who Jack is also seeing on the side. This doesn't play any part in the movie, though. The Navy Doctor has quite a jaunty hat. Now there were two jive hippies who saw the editor killed that night, and because they are poor and weed-addled (and an interracial couple, gasp!) they are pegged as prime suspects. Jack meets the hippy girl and sees a pentagram on her hand, marking her (improbably) as the next victim. The Man is always hasslin' the hippies, man. Full moon again that night, and Jack now changes before our eyes, giving us our first up-close look at the transformation. They use the old time-lapse camera trick, not too effective visually, though end-result make-up is good. Time-lapse is hardly ever done well, witness Legend of the Werewolf and countless Film School semester projects from the 1990s. It's not all bad, instead of shambling around like a zombie, the werewolf hops about on all fours like a real wolf, refreshingly different. Negative points for the four-inch lower canines, which are so distended as to make closing his mouth near impossible. 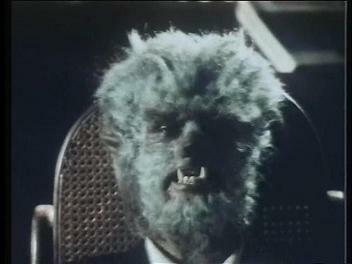 But bonus restoration positive points for the werewolf always being nattily attired in three-piece blue pinstripe suit and power tie. I had this same reaction the other day when Domino's told me they discontinued the Triple Extreme Cheesy Bacon Lover's pizza. Jack is now 100% sure he's the werewolf, though he thinks maybe he's been brainwashed by the Commies, ala The Manchurian Candidate, while he was in Hungary. He does little more than make some failed attempts to contact his girlfriend in Budapest, though, which get him nowhere. He's worried that he'll keep killing as long as there's a full moon out. Someone explain to me the mechanics of the full moon/werewolf thing. Does it have to be exactly full? Because you'd think that only happens for a split nanosecond once every month, the rest of the time it's either slightly less or slightly more than full. Does cloud cover matter? Does being indoors matter? Does being in an opposite hemisphere matter? Werewolves confound me. He also talks to Marion, Nixon's hot daughter, rekindling their smoldering love affair in between horrific killings. 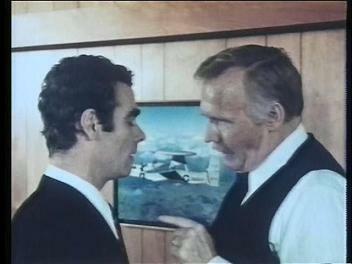 Jack does the right thing and tries to tell Nixon he's a werewolf down at the White House bowling alley, but the Nixon is an idiot and can't understand anything he's saying. Here we learn that Jack never learned to bowl and that the University of Chicago didn't have varsity sports until the 1970s (really?). Note the E-2 Hawkeye AWACS in the photo behind them (I'm a plane nut). 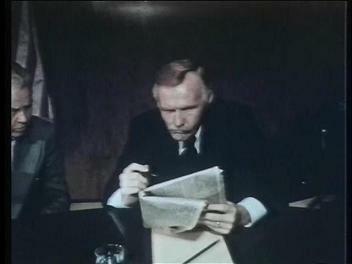 At a Pentagon staff meeting with Nixon and the generals to talk about the "South East Asian problem", and about martial law and a curfew, blaming it all on the hippies and the radical left. A lot of this political satire might have played well in 1974, getting some cheap laughs out of an audience still intimately involved with Watergate, but by 2009, it's just ancient history (in much the same way, Michael Moore's oh-so-scathing barbs at George "Horned Devil" Bush will elicit shrugs of indifference from b-movie reviewers in 2050). Jack runs out when he begins to turn furry. He ends up down in the basement of the Pentagon where he kills a security guard who gets in the way. Nixon gets all his news from the morning paper (I'm guessing not The Washington Post...). 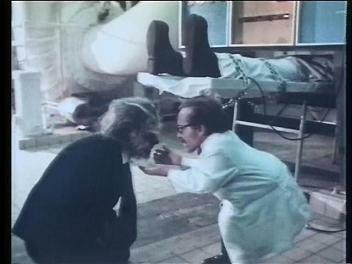 The werewolf then runs into a dwarf mad scientist conducting inhumane experiments on caged people down in the basement of the Pentagon. And th...wait, what? People in cages? Huh? This is (perhaps thankfully) never really explained, but maybe it's some sort of Mutant-X Super Soldier program designed to keep ahead of the Rooskies and their Paranormal Alien-Hybrid Commandoes. Were people in 1974 really that worried about legions of undead US Army zombie/soldiers in the streets of Washington? Hope he's not on the DoD budget. The next morning Jack wakes up and completely loses his mind. He places a phone order for a single silver bullet from Magical Guns-R-Us, determined to end his own life (or at least have a failsafe for anyone around him). Jack then goes to the Attorney General and the Navy Doctor and proves he's the werewolf (not hard, lots of evidence point to him). 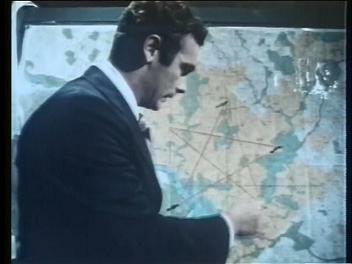 Jack then maps out a pentagram pattern on a map of the District, with each of his four victims at the points, and he makes a big deal about all this. The fifth point lines up to the Watergate apartments (how ironic...), where Jack lives, and he's sure this is where the last victim will die. Huh? Wasn't the security guard a random kill? Is anything really random in a universe full of werewolves? Did the guard have a pentagram on his hand? And what happens after he gets his fifth kill and the pentagram is complete? I wonder if this whole subplot was tossed in here just so characters can make wry jokes about confusing the "Pentagon" with the "pentagram" (the dastardly Military-Industrial Complex was not popular in 1974). Jack has them chain up him up (literally) in his Watergate apartment so that when he turns nasty that night he won't be able to kill anyone (no one seems at all concerned about him actually being an werewolf, more about how it will affect the President's approval ratings). The fair-haired First Daughter Marion comes to visit him (she either has a key or he left his apartment door unlocked while he was chained to a barcolounger). They talk about the gun with a silver bullet, which she reluctantly takes, before Nixon calls on the phone. He needs Jack for a speech with the Chinese leader, and against his better judgment, Jack agrees to ditch the chains and go with him. Most of my girlfriends would just empty out my fridge, take my wallet, and leave. 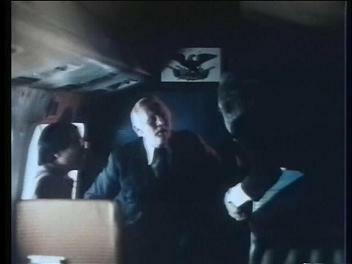 Onboard the presidential helicopter, Nixon chats up the Chinese leader, bumbling his way through the conversation and managing to insult just about everything that the Chinese hold sacred and dear. Nixon, of course, "opened China", which was a big deal back in the 70s, I suppose. 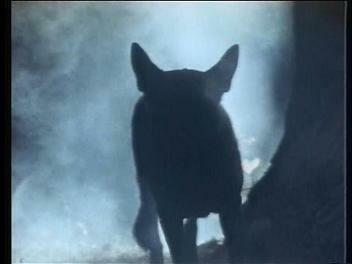 True to his fears, Jack begins to turn into the werewolf sitting next to them and all hell breaks loose. Nixon jumps out of the landing chopper and there's a big fight on the ground as Nixon and the beast wrestle and grapple comically. Nixon is bitten while the Secret Service just sorta stands there, and the werewolf runs off. Before he passes out, Nixon stammers, "I just want to make one thing perfectly clear...", which was one of the real Nixon's favorite catchphrases (along with "Get me a sweatmop!" and "Woodward, who?"). Nixon vs. the Werewolf, which should be the undercard to Agnew vs. Edward the Sparkly Vampire. 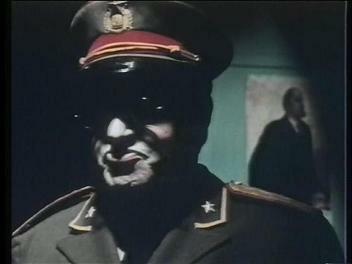 The werewolf runs away, managing to elude the entire District police force and the US military, and shows up at Marion's apartment. Does she live in Watergate also, or is this Jack's apartment? Because what about that whole cringing subplot about the pentagram on the map with the final point at Watergate? Marion screams like a banshee and runs about as the werewolf hops around the room growling at her (he doesn't want her, he only loves Bella...). 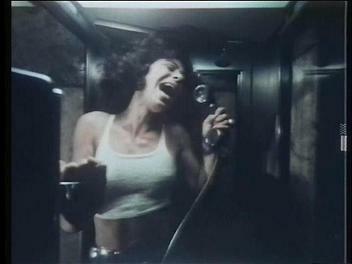 Trapped in the bathroom with the beast, she shoots him with the magical silver bullet. 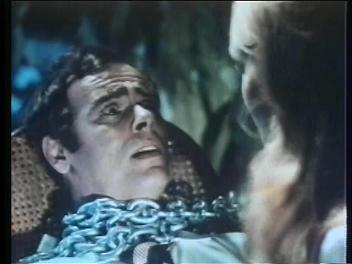 As the werewolf dies, it changes back into Jack, much to Marion's horror. In typical political fashion, they spin it to make it all go away, giving Jack a hero's burial for "taking a sniper's bullet". The gun, the Attorney General deadpans, should be buried with "last year's nerve gas" (harhar). 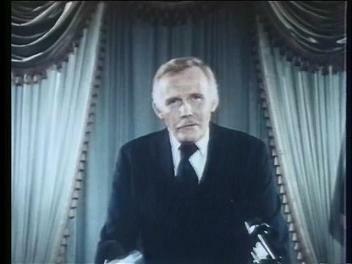 The stinger is Nixon, who Jack bit before running off, turning into a werewolf himself during a press conference as the credits roll. Make your own assumptions about what this says about Nixon's political motivations. Written in December 2009 by Nathan Decker.